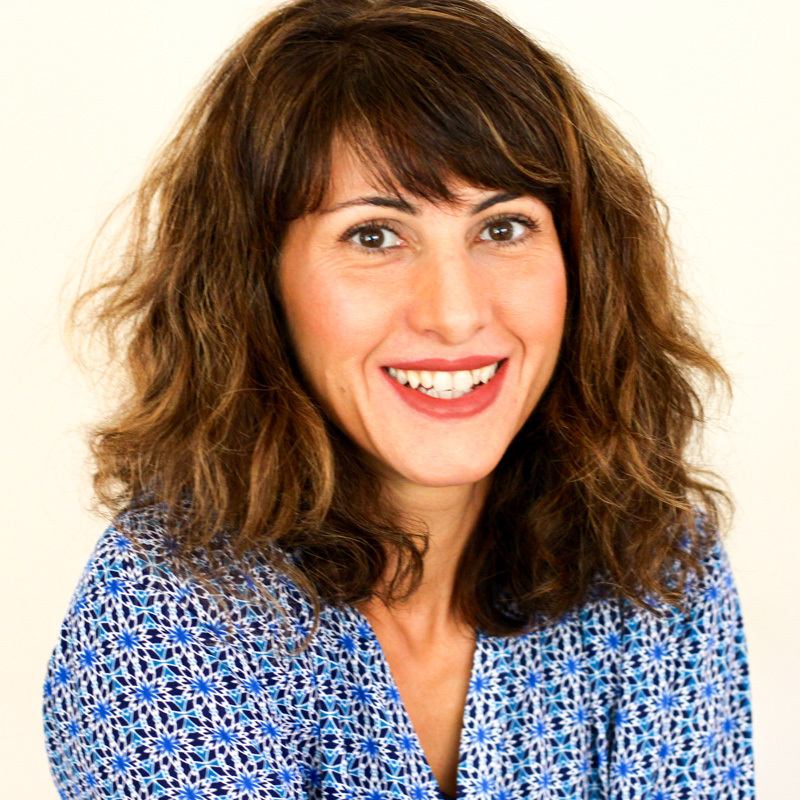 In case you have a little more baking muscle in you and not quite tired of sugar just yet (me? 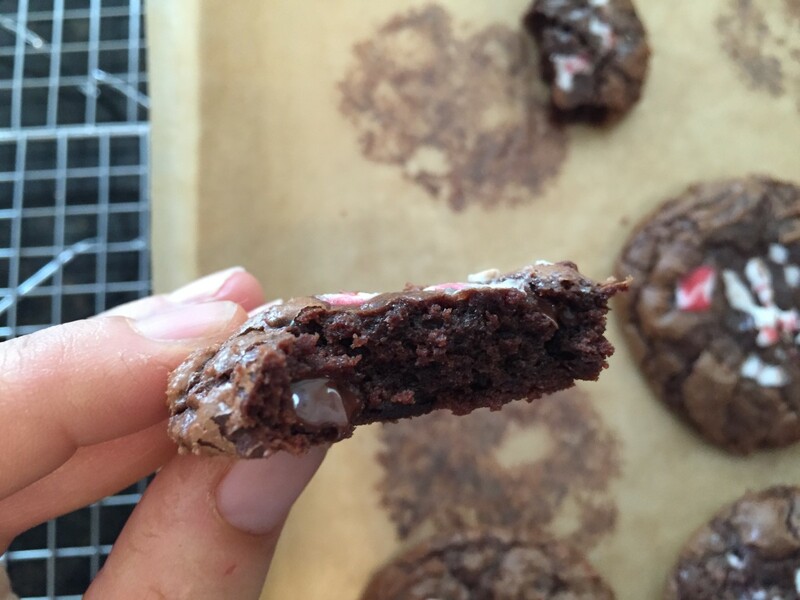 never) I have a chocolate peppermint cookie, more like a brookie recipe for it’s brownie like center, that I had to share with you before Christmas. I have always admired chocolate peppermint bark at Williams Sonoma from afar, which pushed me to create my peppermint bark marshmallows, but that wasn’t enough. It never is, is it? 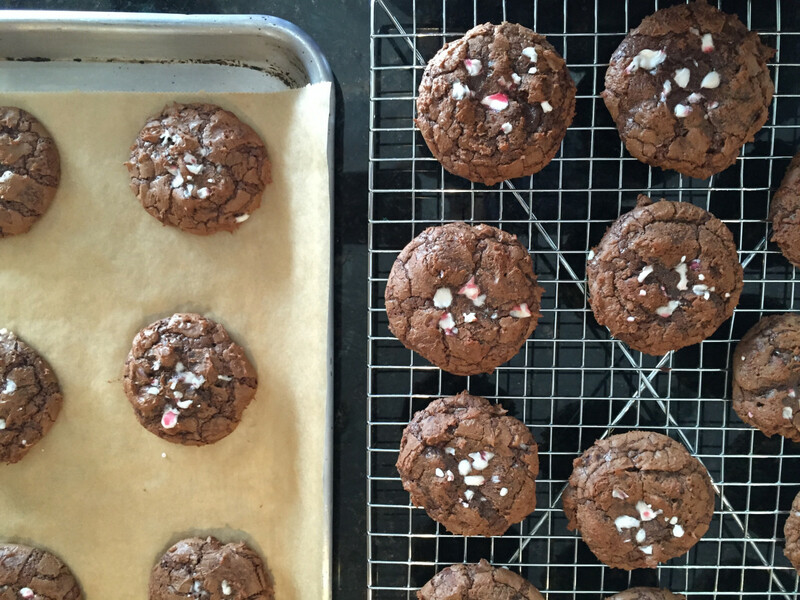 I had to create something chocolate/peppermint in a cookie form. 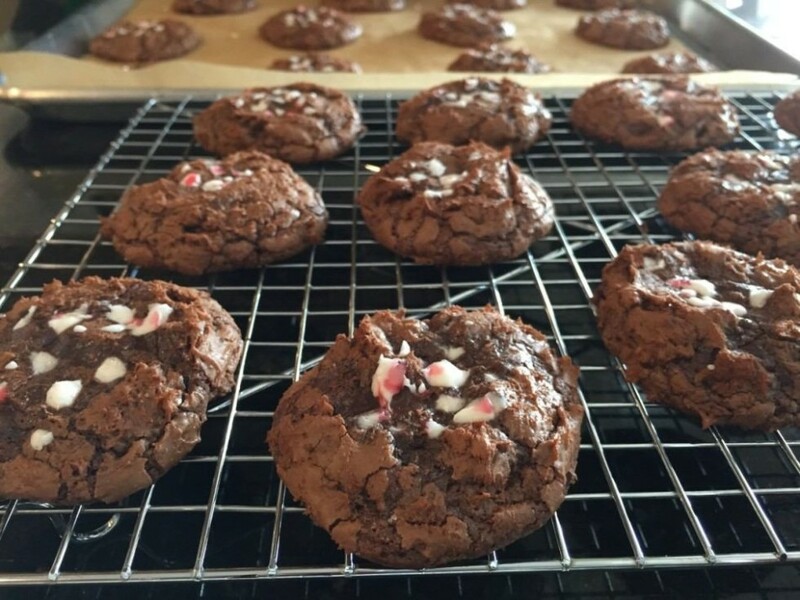 Now I know there are many chocolate peppermint cookies out there but these have the fudge-like center and crackly top that you will find irresistible and wonder how this can be gluten and dairy free. These taste pretty outrageous right out of the oven or chilled. I still haven’t decided which is better. Proudly, I did manage to hide these and share most as holiday gifts. There is such a rich chocolate flavor to these cookies, which I contribute to not only all the chocolate in here, but also the espresso powder. It really deepens the chocolate flavor without leaving a coffee flavor behind. A very Merry Christmas to all who celebrate!! Melt the oil, buttery spread, and 1 cup of semisweet chips in a glass bowl set over a saucepan with 1/3 full of simmering water, making sure the water does not touch the bowl. Turn off when melted, set aside. 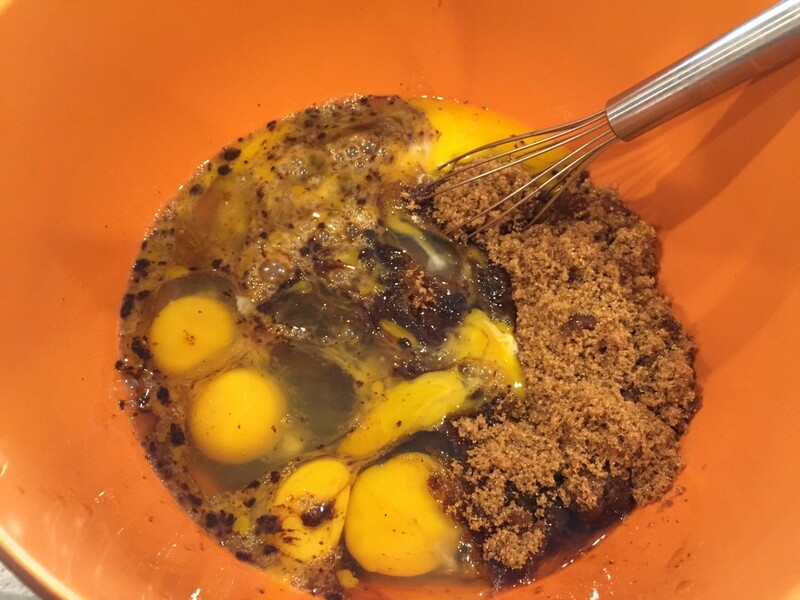 In another bowl, whisk eggs, espresso powder, light brown sugar, vanilla extract, peppermint extract. 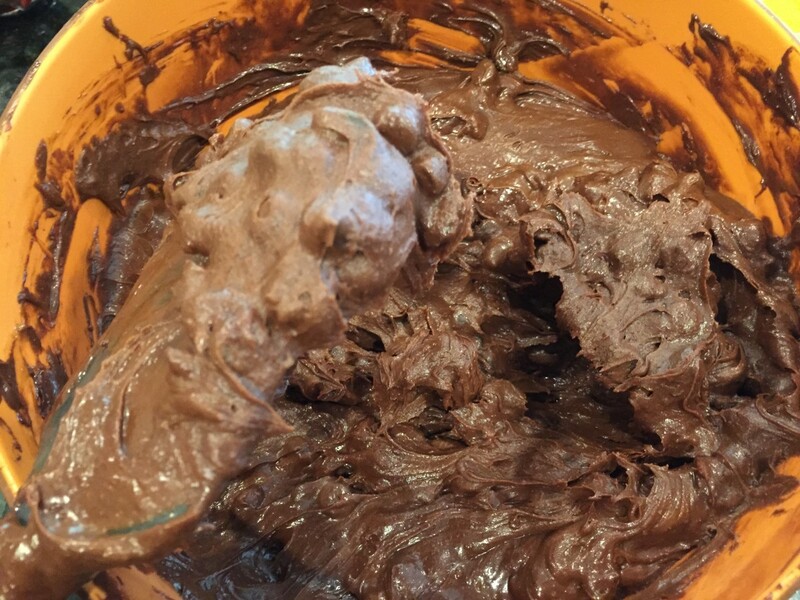 Fold melted chocolate into the egg mixture. 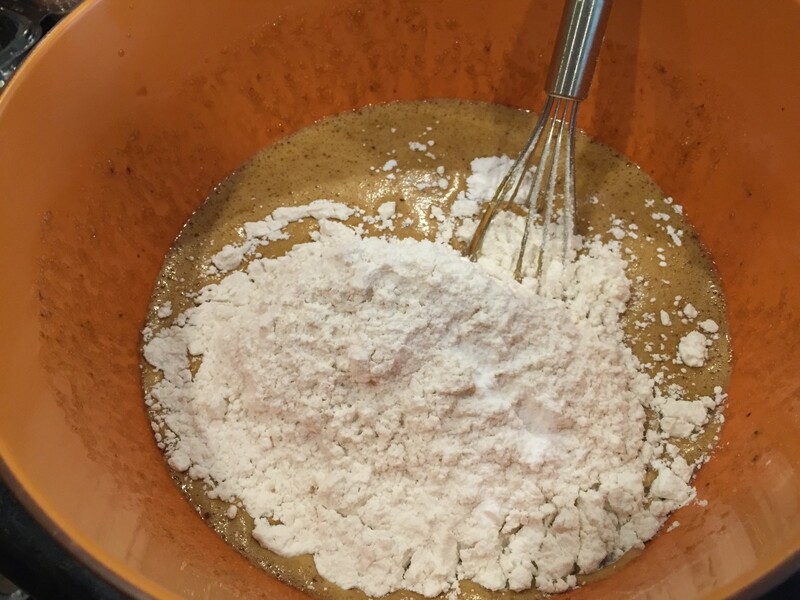 In another small bowl, combine flours, baking powder, and salt. Add to the chocolate mixture, stir to combine well. 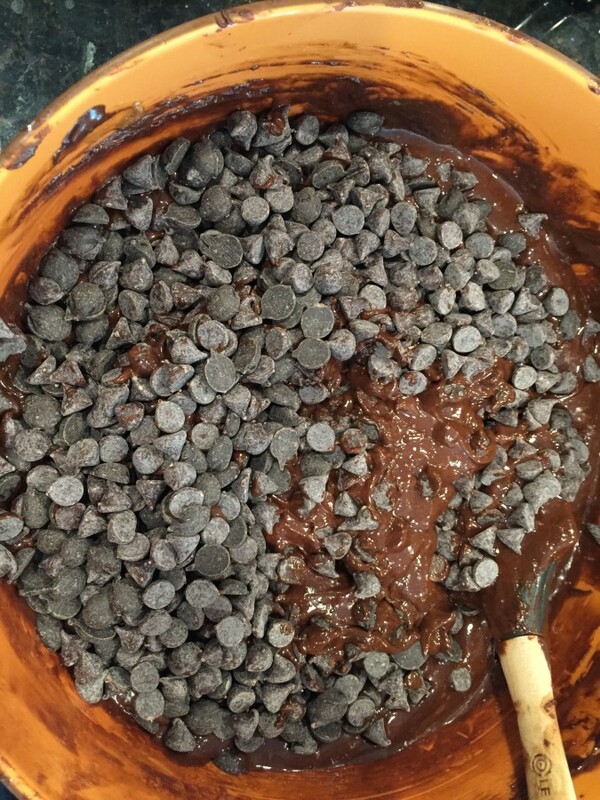 Fold in the remaining 1 cup of chocolate chips. The batter will be very thick and difficult to stir. Freeze for 5-10 minutes, until batter hardens slightly. Line 2-3 baking sheets with parchment paper. Using a mini ice cream scooper, scoop onto baking sheets about 2 inches apart. Gently press down just a bit and generously sprinkle on crushed candy cane. Bake for 11-12 minutes. Cool for 20 minutes before transferring to cooling racks. 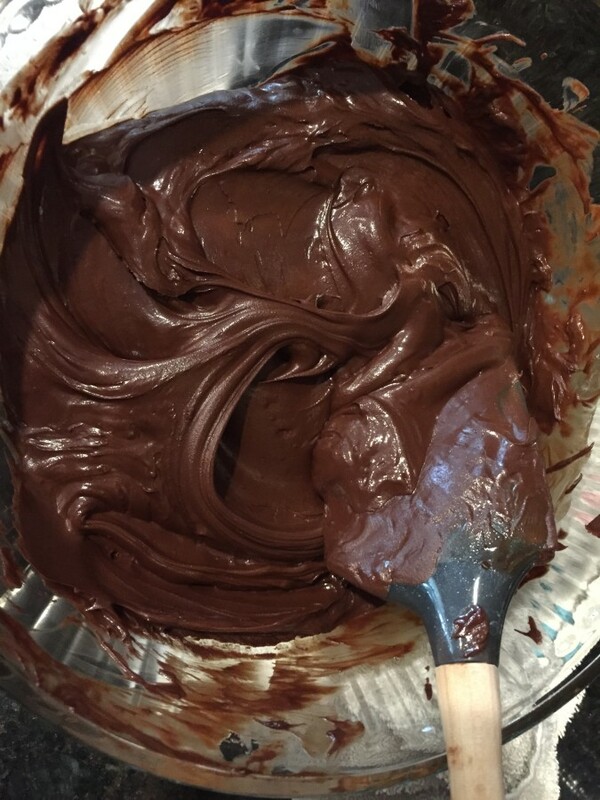 They will stick a bit to the parchment paper, hence it’s fudge like center, so just gently twist to remove. Cool completely on cooling racks before storing in airtight containers. The cookies also freeze very well, good for a month sealed in an airtight freezer safe container with parchment paper between each row of cookies. For gift giving: I froze the cookies (to maintain their shape and freshness) then put each cookie into a plastic cookie bag (found at Michael’s craft store) and then put them into holiday tins (while still frozen). They ship very well in USPS 2 day priority boxes. Some other other variations: Omit the peppermint extract and add walnuts for a walnut brookie, or toasted hazelnuts with hazelnut extract instead of peppermint for a “Nutella” inspired brookie cookie. This may hinder any self control. Trust me. Jessica! That bite OMG. Wish I got some of those cookies, guess I have to bake them myself! These look uh-mazing! No mixer needed? Not sure if I read that right. Megan, he was out of town! I made these to give away as gifts so there weren't many left behind. My three younger boys managed to do a good job polishing them off :) I haven't made these egg free (yet), my first inclination would be to combine ground chia seeds and oil with arrowroot but haven't come up with a "formula" just yet. I will update the post when I do, hopefully soon! Nice take on peppermint bark. Yum!! Jessica, this may be a silly question but was wondering what brand of chocolate chips do you suggest? Oops, I usually add that in. I used Enjoy Life dark chocolate chips because they are also soy free in case my twin boys sneak one. 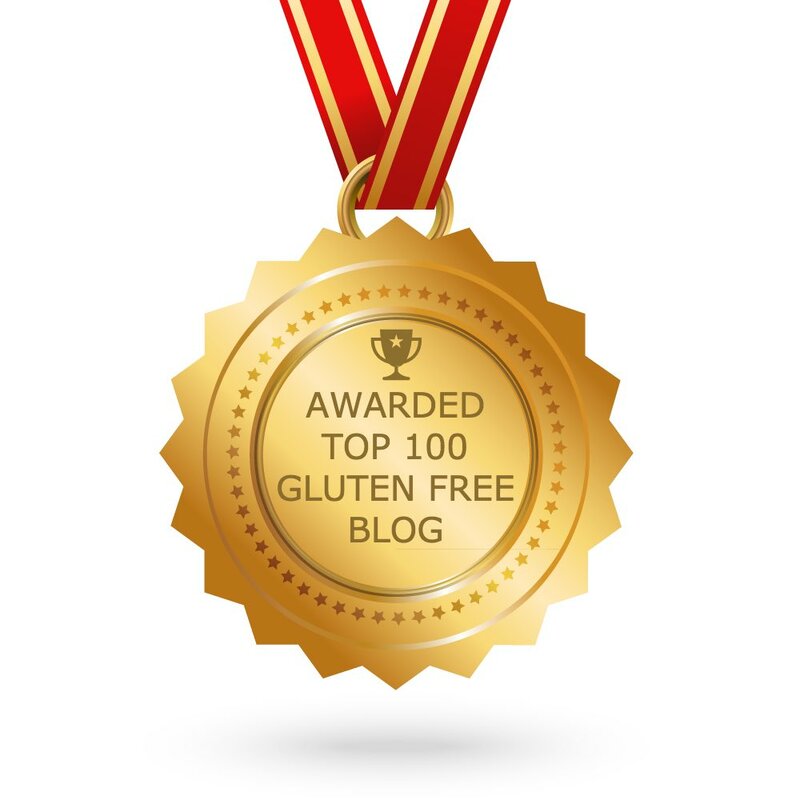 If you can tolerate soy, Guittard makes gluten/dairy free semisweet chips with soy lecithin. I don't think I can share these with Santa! ;) My daughter, who is home from college, just went out to get some remaining ingredients to bake these this morning. Thank you for posting this before Christmas Jessica, I can't wait to bite into a cookie! No cookies for your oldest son? Oh no. I bet you are working on an egg free version huh? These look marvelous and my kind of peppermint bark (I would crave them from afar too!). Making these today!! Gina, he was out of town! I am, I used to send these to him while he was in college (before his egg intolerance discovery) and he has put in his egg free request. The brownie like texture on top looks scrumptious. I have never used espresso powder in a cookie recipe before, hmm interesting. That chocolate gooey bite is calling me into the kitchen. 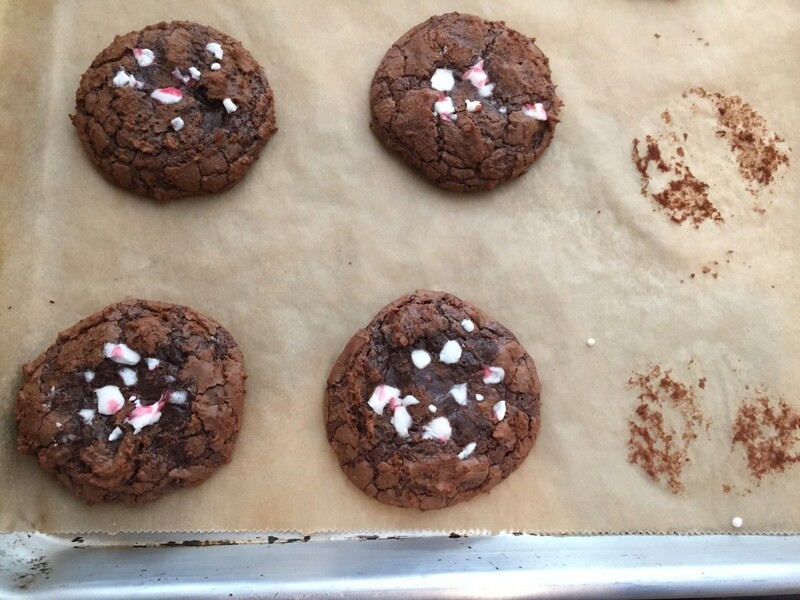 Great idea on turning a peppermint bark crush into a cookie love affair. Now MY love affair! ;) YUM. Merry Xmas!! Just saw these and will have to make them next week! Not too late right? Cheers!!! Gave this recipe a try because the photos tempted me so and it looked pretty simple. 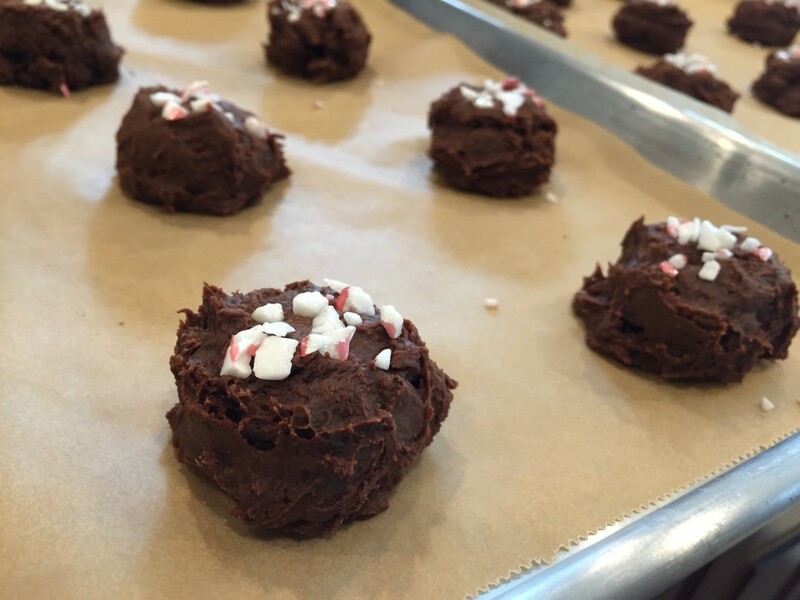 I have to say the mildly peppermint flavored fudge center in these cookies are incredible. Amazing. Now I need to try the peppermint bark marshmallows next. love the coffee addition! not everyone does that this sounds wonderful (and addicting)!! Had to comment how wonderful the brookie cookies are! Not overly sweet and wow, taste the chocolate. YUMMM. So happy to hear you loved the cookies! Thanks for sharing Nicole!